Indonesia was the last stop on our Southeast Asian jaunt last year. 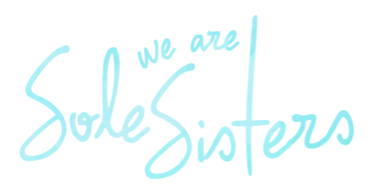 And what did we do there? Eat, Love and Surf of course! 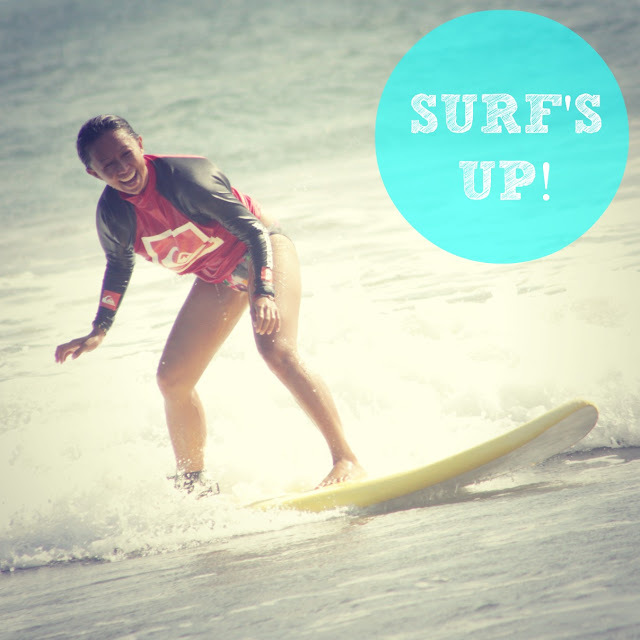 We got access to 3 day lessons with Quiksilver Surf School Bali on Legian Beach! How cool is that? I was pretty confident I would have a lot of fun in the water. 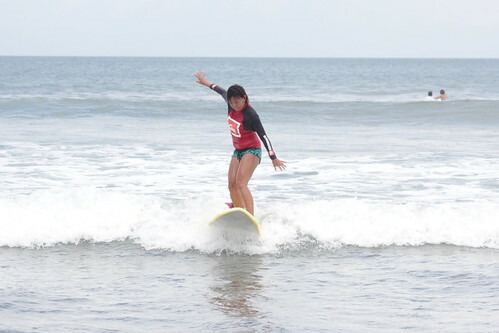 It was Chichi's first time to try surfing and she was really excited too! 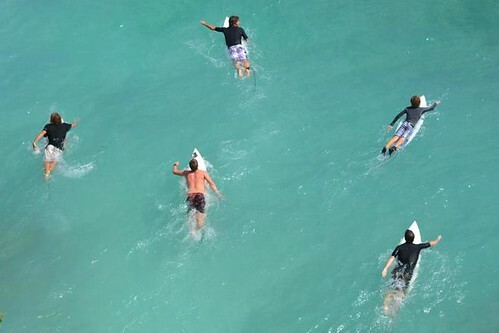 Quiksilver Surf School was a great place to learn how to surf. It was in a safe environment in waist deep water, the instructors were very friendly and professional and we were in a group of 10 beginners which also guaranteed it would be a lot of fun to learn together! The instructor started giving tips and showed us how pop up and stand on the board. He taught us how to speed up and slow down. But what I liked was that he didn't just teach us how to surf, he also told us to be careful in the water. To watch out for other surfers and to practice proper surf etiquette. Watching him from the back, I thought to myself "How hard can it get? Paddle, ride, stand! Easy!" It was so beautiful in my mind, like a scene from Blue Crush! But as soon as we were asked to get into the water I wasn't so sure anymore. Indo waves are not that friendly to start with. And we were all beginners in one area, there was no stopping us from bumping into each other! But Chichi and I did our best to hoist ourselves on the boards, balance and go where the wave took us. It wasn't pretty! How do those pro surfers make it all look so easy and graceful? The worst part was this 6 year old kid who was standing up wave after wave and putting us all to shame. We watched as she glided effortlessly in the water with a big smile on her face. 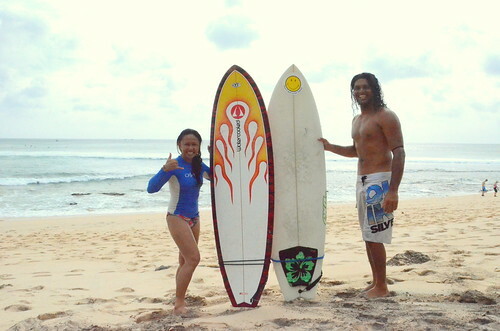 But Chichi and I survived those 3 intense days of surf lessons. We even have t-shirts, gashes and certificates to prove it! Fast forward to 2012. This year, I was craving for some Indo waves and thought I should pay Bali another visit. After staying at our gorgeous Roomorama Rental in Legian, we took an hour's ride to Southern Bali for more challenging surf breaks. I felt so ready for those Indonesian waves. I had gone to THE Quiksilver Surf School Bali after all! What greeted us were massive, killer waves that bared their teeth! My friend Adi, who had gone with me on this trip, had been to this side of Bali before. But she swore that only a month ago, the waves were much smaller and less life threatening. We chose the friendlier beach breaks of Dreamland as our first spot. But when we got there, the waves were still huge, overhead and can slam down on our childlike frames in a matter of minutes! Not friendly at all. So we took our mats out and stared at the ocean for about an hour until I couldn't stand it anymore. I had to surf or die trying! I took out my 6'6 fish surfboard from the bag. I had carried it a few thousand miles to Indonesia after all and paid the sports equipment fees so I had to put it to good use. I attached the fins carefully making sure it wouldn't fall off. I even waxed it all over to keep myself from slipping. Lastly, I tied the leash securely so I wouldn't lose my lifeline after getting wiped out. While I was doing this, I noticed a tall, muscled, curly haired man beside us eyeing me strangely. He was probably wondering if I was really going into the water. I shrugged it off and went back to my waxing. Then I put on my rash guard and ran to the beach with my board, excited to surf my first Indo wave on this trip. 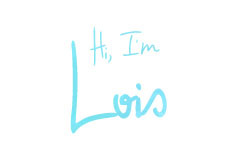 But before my feet even hit the water, I heard someone screaming my name. 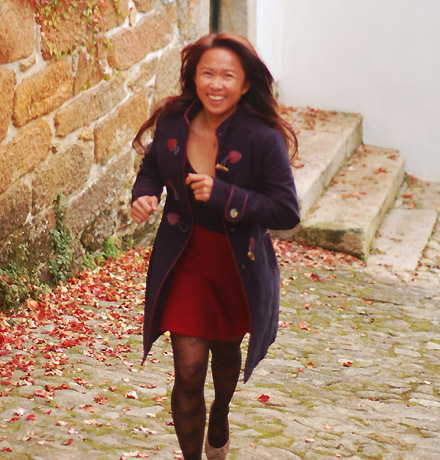 I looked back and saw Adi and the muscled guy waving furiously for me to come back. It looked urgent. "Now what did I do wrong?" I did everything by the book- board waxed, leash properly attached, confidence meter high. I was ready to get stoked! I walked back with a flustered look on my face and asked "Now, what's the problem?" Mr. Muscle had a smug smile on when he said "Look at your fins!". I took a quick look and saw they were still there. I didn't get it. It took a few seconds but then it hit me! I had screwed the fins on backwards! Mr. Muscle jokingly said "I knew there was something special about you the moment you waxed your board. But I didn't realize you had a death wish!" And there goes my ego! My face turned bright red instantly. How can I make such a shtoopid mistake? I'd been surfing for years by then and never had to screw the fins on by myself! 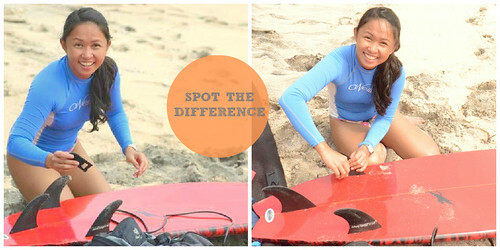 I blame it on the helpful surfer boys of Baler! Al, as he finally introduced himself, proceeds to help me re-attach the fins- facing the right way this time. He waxed my board properly and even went out with me on the water. I felt like the ultimate damsel in distress! But it was a great wake up call from the surfer gods. The misadventures don't end here. Next time, I'll share with you how I got flushed into a beautiful white sand beach on the wrong side of the mountain and introduce you to the Paddle Dictator of Lombok! Here's group photo with Adi, Al, his daughter Dana and friend Adriano. Surfers all around! So the big question is: What would have happened if I tried to surf with my fins screwed backwards? Make a guess by leaving a comment below! Our surf lessons were graciously provided by Quiksilver Surf School Bali and we had a great time learning on Legian Beach. 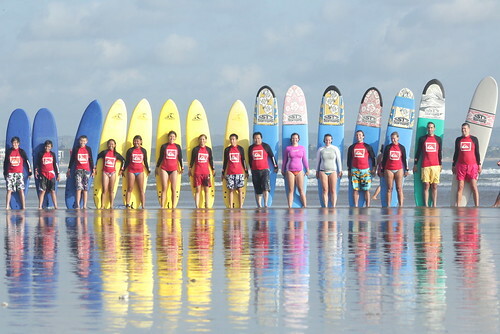 You can check out their website: www.quiksilversurfschoolbali.com and like them on facebook. 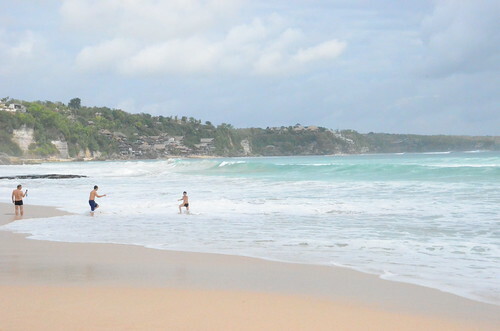 Dreamland Beach is less than hour's drive by car or motorbike from the Ngurah Rai International Airport in Bali. We rented a car with a driver and paid about 100,000 IDR (10.50 USD) for a one way trip. Motorbikes are much cheaper for only half the cost per day and it comes with a rack for the surfboard. But don't leave your international driver's license at home! you will revolutionize the sport by surfing backwards? update us if your experiment works! good luck! Thanks Doc Wends! Yes you should try surfing! You'll get addicted! I can totally relate to the wipeout and the near drowning Ed! Yup Southern Bali waves can get really big an vicious! But it's all part of the sport! Hope to surf with you in the future! Doi and I miss you! too excited much? haha. i really have to try surfing very soon. very very soon.